The bird sitting on an oak tree branch announces: Spring is coming. 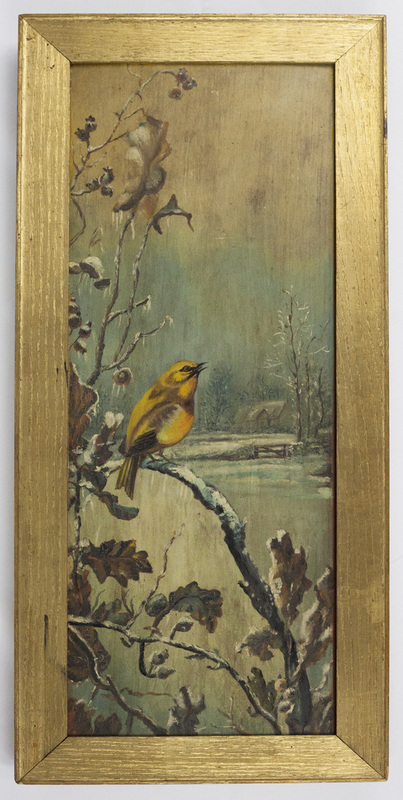 The bucolic winter landscape of a cottage by a frozen lake received a stroke of warmth with the vivid oil paint colors of the mustard-yellow creature. This panel, now framed like a painting possibly came from a door that was so carefully painted that it was repurposed, promoted in status to dress up the house interior walls. It is possible to assume that it had a lot of emotional connections to the family where it belonged.